Checkbox Survey Version 5.5.0 Updates – Checkbox Survey Inc.
A new update is scheduled for release this Tuesday, June 19th, for Checkbox Online customers with access to Checkbox 5. Version 5.5.0 marks our largest patch since the initial release of v5 in 2011! This landmark release introduces several exciting new features and resolves a number of issues, a full list of which is available below. Checkbox 5 European Online customers should be updated automatically at 5:00PM (EDT) today, 6/18/2012. All other Checkbox 5 Online customers should be updated automatically tomorrow, 6/19/2012, between 6:00AM and 9:00AM (EDT). Server customers should be able to access the 5.5.0 update from the Products area of our customer support site on 6/26/2012. Always back up your database before upgrading or patching. Please note that this update is eligible to all server customers with active support contracts. Customers with questions about the term of their support contracts or who would like to renew their support should email sales@checkbox.com or call 866-430-8274 (Int’l 1-617-715-9605). We’ve streamlined the Survey Manager Dashboard by simplifying the Overview tab and consolidating permissions and response options within the Settings tab. On the Overview tab, a new survey response histogram displays a visual representation of collected survey responses over time. All activation options, including the “activate”/”deactivate” setting and activation date rage, have been grouped under the Survey Status view. Survey response options and limits have been moved from the Dashboard’s Overview tab to the Permissions view of the Settings tab. 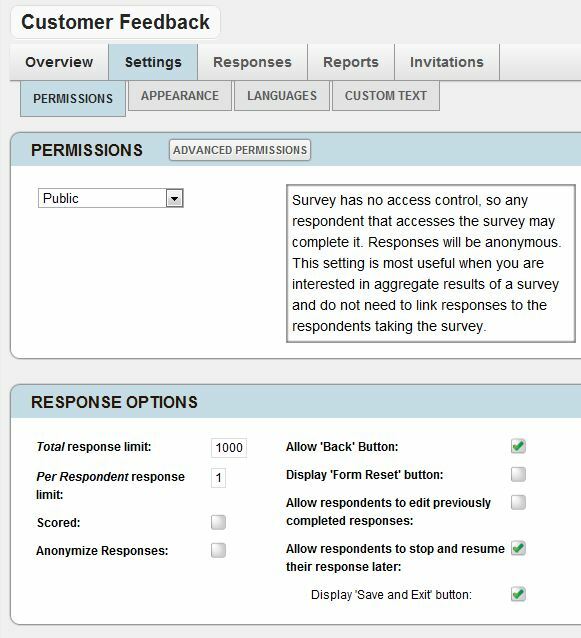 This new arrangement groups all permission-related settings into a single view for easy access to survey permissions, response options, and response limits. 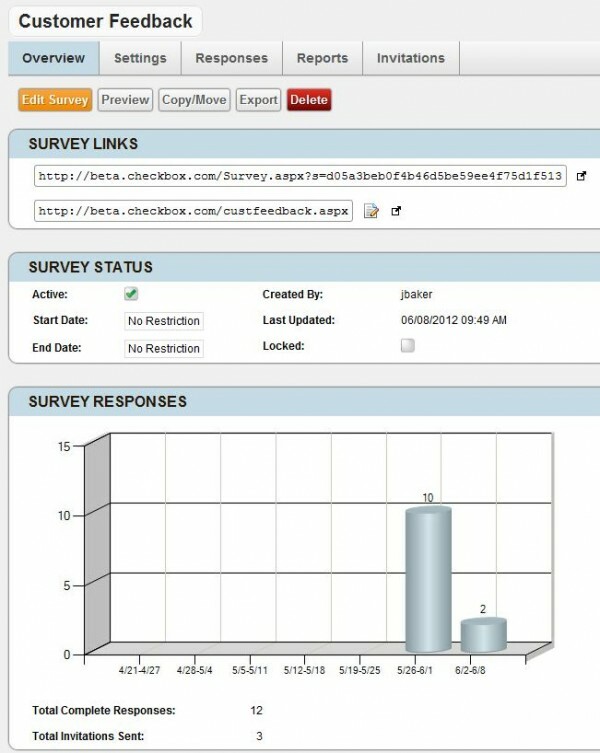 Form Reset is a new survey-level response option that allows respondents to clear all responses on a survey page. When enabled, a “Form Reset” button appears with the survey navigation buttons. This feature is especially useful when non-required Radio Button questions, the choices of which cannot be deselected, are included in a survey. This option is found under: Survey Dashboard >> Settings >> Permissions >> Response Options. In response to customer feedback, a new Language Selection option is now available in the Languages menu of the Settings tab. When “Browser Detection” is selected as the desired user prompt Checkbox will automatically apply the appropriate available language (language must already be added to Supported Languages within Checkbox) based on the respondent’s browser language. If a respondent is using a browser language that is not supported by your account, you have the option to either set a default language or prompt the respondent to select from a list of available languages. 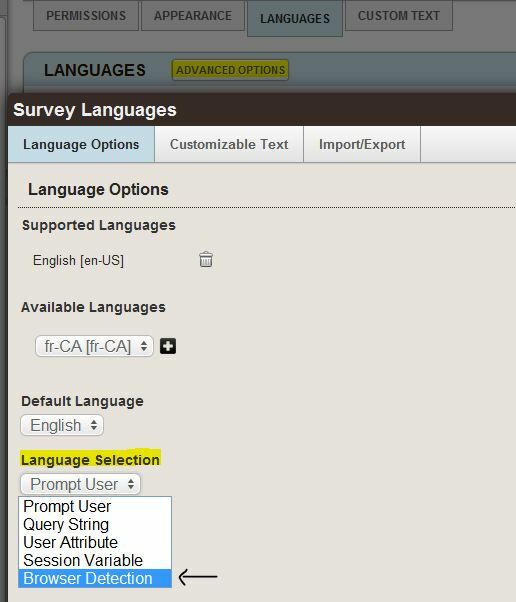 This setting can be found under: Survey Dashboard >> Settings >> Languages. Resolved time-out issues that would occur when importing surveys containing items with a large number of answer choices. Resolved time-out issues that would occur when exporting a high volume of survey responses. Page conditions should now carry over correctly when the survey is copied. Matrix Item row conditions should now carry over correctly when the survey is copied or imported. Merged text should now carry over correctly when the survey is copied or imported. Matrix Summary Items should no longer throw an error when running a report. Long report lists are now displayed on one or more pages in the “View All” report list in the Report Manager. Resolved issue where if two or more unique survey invitation links were opened in the same browser they would redirect to the same survey. Unsent invitations should now display correctly in the Invitation Manager. It is now possible to export invitation details from the Invitation Manager. Resolved date validation error on Open-Ended Single-Line Text Item. Resolved issue where changing a user’s username or email address would cause the user to disappear from invitation recipient lists they had originally been included on. Invitation recipients can now be removed from the recipient list after invitation is sent. Resolved paragraph alignment issue on Message Items. Deleting an email list should no longer throw an error. Invitation sorting should now function correctly. Resolved issue where users could not be removed from a folder ACL (access control list) after being added. Resolved issue where deleting a user from a report ACL would not remove that user’s access to the report. Setting a “Max To Select” value on Checkbox Items should now function correctly. Resolved a File Upload Item issue where the “Clear” button would not remove a previously uploaded file. Resolved issue where apostrophes ( ‘ ) would display as quotation marks ( ” ) in answer choice text. Resolved issue where apostrophes ( ‘ ) in a report name would display as the HTML encoded version (&amp;#39) when the report was copied. The Import User process should now correctly validate user names. Date/time filters can now be set on reports. A UI Date Selector (date picker) will now appear when applying page/item conditions or branching rules where a date is entered as the source value. Hyperlink Redirect Item now has the ability to redirect instantly, without displaying the Completion Events page. Creating a profile property with a space should now save correctly. Folder Permissions and Folder Options buttons should no longer disappear when the folder contains a survey created by an Active Directory user. Resolved issue where copying a page to a specific location within a survey would automatically set it as the last page in the survey. Slider With Images Item should now correctly display images above or below the slider bar based on the location setting selected in the item editor. Resolved issues with Slider Items failing to load in question libraries after a version patch. All surveys that a user has access to should now appear in the “Copy From Survey” list in the Library Manager. Resolved profile property display issues that would occur when adding a new user. Email Address Validation on Open-Ended Single-Line Text Items has been modified to recognize “Non-Standard” email addresses. Question libraries can now be deleted. Conducting a Universal Search should now function correctly. A “Licensing” tab has been added to the Settings Manager in Checkbox Online accounts. This view displays current limits applied to the account, as well as a list of all licensed users and users that have access to support. Exported survey text can now be edited in Excel and re-imported into Checkbox. Resolved issue where line breaks could not be added to Message Items and Email Alert Items. Several UI changes have been made to accommodate 1024×768 resolution monitors. Resolved style issue where font-sizes did not saved correctly. Resolved style issue where Matrix “Default Row” and “Alternate Row” colors did not display correctly in surveys. Resolved style issue where Matrix “Answer Font” colors did not display correctly in surveys. Resolved style issue where Matrix border did not save correctly. Resolved style issue where Progress Bar height did not save correctly. Reports should now display the correct applied style applied when viewed anonymously. Invitation message preview should now display with intended formatting. Text on the “Save and Exit” page is now properly aligned. Slider With Images Item now displays appropriate amount of space after the item. It is now possible to display the title of a survey on associated reports. Checkbox, Radio Button, and Drop-Down List items should now look the same as their respective item previews. Resolved many CSS Issues to improve ease of use. InvitationManagementService.CreateInvitation(strin g authTicket, int responseTemplateID, string name) Has been altered to return a InvitationData object upon successul creation of an invitation. InvitationManagementService.ListEmailListPanelAcce ssListPermissionsForUser(string authTicket, int emailListPanelID, string uniqueIdentifier) Should no longer create a new user principal if the unique identifier does not exist. NOTE: Please make sure that you test all your code against the updated web services to ensure that it still works properly. NOTE: Before patching or upgrading to version 5.5.0 you MUST create a backup of your database.